While stuck home during a blizzard, I decided to take matters into my own hands and paint my daughters' room. This is major because although I am creative, I usually direct DIY projects with my vision for someone to execute my idea. With that being said, if I can do this then ANYONE CAN! I'm very serious people, you have no idea. It's super easy. I thought to myself, how can I get a simple design to incorporate another color without measuring, mathematics, or help. It was a one woman show people, outside of my kids (who caused more work in the end). Gotta love them though! They had great work ethic! For me, my walls were already painted white, so transitioning the design to have white borders was easy because of this. If you want to get technical start by measuring the wall going across. Then do this first design directive. Divide by two, the number you get is the center of the wall. Position the scrapbook paper sideways like a diamond on the wall with the point exactly on center of the wall. Example: The wall was 200 inches across, you divide that by 2, which is 100. The point of the diamond should be on the 100 inch mark on the wall. Then use the painter's tape all around the edges of the diamond so it remains on the wall. Paint the edges of the tape; Level the sides to assure it is leveled. Add diamonds on each side until you are at the end of each side of the wall. Easy/lazy way. The way I did it. No math or measuring. Start at the top of the wall from the cealing from the left side of the wall. Place a scrapbook paper sideways so that it appears as a diamond. Assure the tip of the diamond if at the very tip of the wall close to the ceiling or ceiling. add painter's tape completely around the diamond as in the pic below. Check the level of the diamond with the with the level. Once it appears leveled then off to the next diamond. Assure the left point of the diamond touches the other. Add painter's tape. Level the assure continue the process until the entire row is complete. The go to the next row and repeat the process. 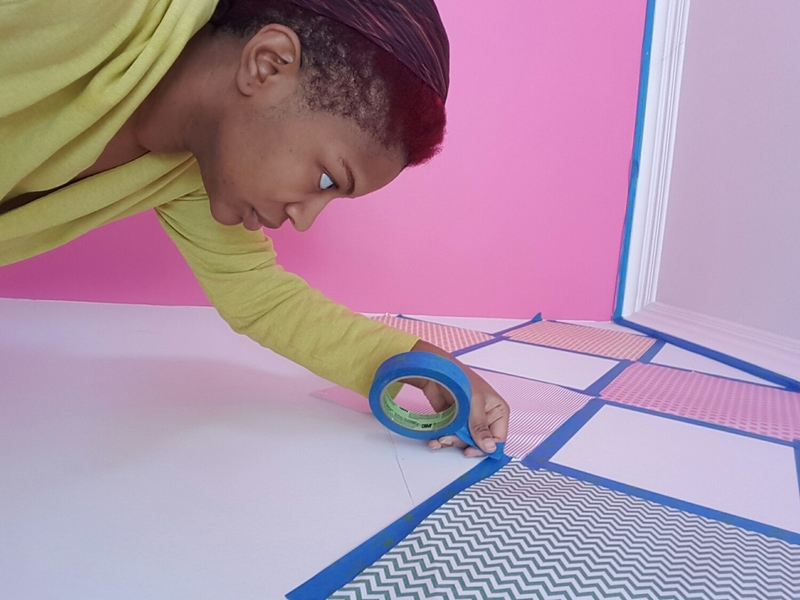 Take the color of the paint that you will paint the section near the painter's tape and paint the inner portion of the diamond to avoid error like seeping. Once the paint dries (should NOT take long), paint inside the square. Two coats of paint. Remove the scrapbook paper. You might have to do some touch ups, but it will look fabulous when completed.